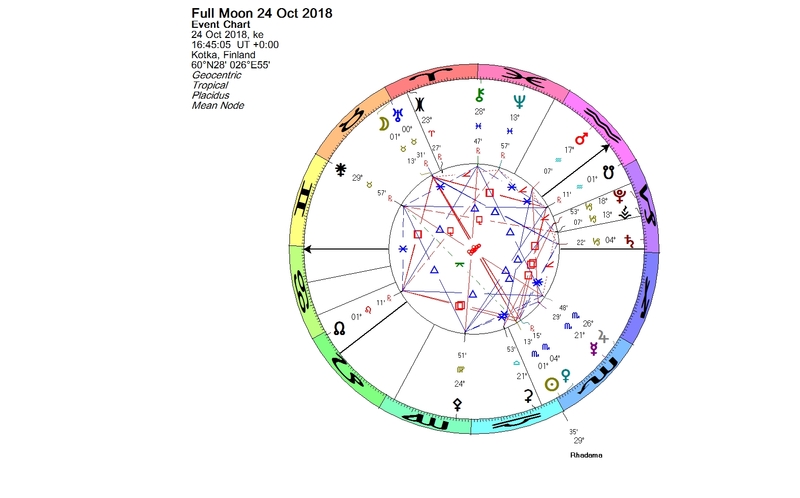 The chart of this Full Moon is interesting. The Moon at 1+ degrees of Taurus is in conjunction with Uranus, the planet of disruption and change. The Full Moon is always an opposition of the Sun and the Moon. Now the Sun in Scorpio is in conjunction with Venus, the ruler of the Taurus sign. Venus is retrograding, and it is only two days from the inferior conjunction to the Sun. Inferior conjunction is the moment when Venus is directly between, and in line with, the Earth and the Sun. It is a beginning of a new Venus cycle, the same way as the New Moon starts a new lunar cycle. The Sun and the Moon are exactly squaring the lunar nodes, the points where the yearly path of the Sun and the monthly path of the Moon intersect as seen from Earth. The nodes are always opposite each other, forming an axis. The North node is associated with the future and the South node with the past, and thus the meaning of the axis is often seen as karmic. The points which square the nodes are balancing points. The North node is now in Leo, the sign ruled by the Sun, and the South node is in Aquarius, ruled by Uranus. Taurus and its ruling planet Venus are associated with values. Taurus, Leo, Scorpio and Aquarius are fixed signs, and they resist change, they want to maintain. Uranus wants to break down, and the new phase of Venus and its retrograde movement want to re-evaluate and start something new. 38083 Rhadamanthus in the last degree of Libra is in conjunction with the Sun and Venus in Scorpio. 38083 Rhadamanthus is a trans-Neptunian minor planet named after a wise king of Crete, who later became one of the judges of the dead, because he had such a great sense of justice. He was also said to be a tutor to Heracles. The composition of the chart is contradictory, but the wisdom of Rhadamanthus is guiding us. This entry was posted on Wednesday, October 24th, 2018 at 11:22 pm	and is filed under Full Moon. You can follow any responses to this entry through the RSS 2.0 feed. You can leave a response, or trackback from your own site.